Teens love to act crazy, push boundaries, take chances, and explore opportunities, so why not channel their energy and excitement onto the stage? These 30 short plays, ranging in length from three to seven minutes, give actors the opportunity to create outrageous characters in the context of situations they know so well. With natural dialogue and believable situations, young actors will love that there are no complex issues to deal with and no lessons to learn — just real life teen dilemmas presented in a comedy format. 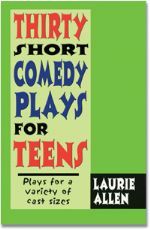 Written for mixed casts of two to six actors, each play is complete with stage directions, simple props, and a setting. Read more...Contemporary situations enable students, actors, and the audience to relate easily to the material, such as Un-Identical Twins, Four Boyfriends, Last Free Summer, and The Babysitter. Suitable for all ages, even inexperienced young actors will have the opportunity to entertain audiences a they show off their talents and do what teens do best — laugh!